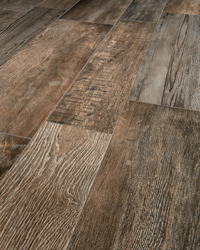 Bar Harbor is a glazed porcelain blend of mixed wood looks highlighting the grain, wear and structure of reclaimed planks. Two large formats (6.5" or 9.75" x 39.5") can be combined for a true craftsman look, while 4" x 13" mini planks can create a herringbone or parquet look. The unique 4” Hexagon mosaic is perfect for accents and shower floors. 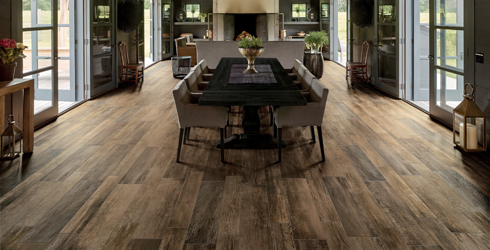 Bar Harbor porcelain tile is available in three robust shades and is suitable for all residential and most commercial applications.